As with everything else in our lives Aaron and I decided where we should go for our honeymoon based around food. We had visited Japan and China in recent years so we decided our honeymoon was the perfect opportunity to make it to another Asian country and selected Thailand. We chose to go to three different cities over the course of our two-week honeymoon; Chiang Mai, a city in Northern Thailand; Phuket, the largest island in Thailand and Railay Beach a tropical peninsula by the City of Krabi. Summer in Thailand is the tourist off-season, however, it is also their rainy season. While most areas were not crowded and perfect for a romantic honeymoon, we did have a few rainy days. Luckily monsoon season starts in September and there were only a few tropical storms that came in for a few wet hours, cutting into the staggering heat and then clearing up. It was nice to travel to a place where we could actually take advantage of the conversion rate. The conversion rate in Thailand is currently about 30 baht to 1 dollar. I would advise ordering money ahead of time through your bank branch. It made it easy to have foreign currency without any fees right when we got off the plane. Getting to Thailand can prove to be quite the trip. We flew from Los Angeles to Shanghai and following customs and a short layover in Shanghai we were off to Chiang Mai for a grand total of 22 hours of travel. We were extremely lucky as our honeymoon was a generous wedding present from Aaron’s parents and they upgraded our flight accommodations. Seated in business class is the best way to handle a long flight. With seats fitted in little pods that recline completely into a bed and in-flight meals of lobster thermidor and beef noodle soup we were able to get a good amount of sleep so the time change didn’t affect us as greatly as it would have otherwise. Chiang Mai is located in the Northern part of the country and is Thailand’s second largest city. We stayed at the Four Seasons Chiang Mai about 40 miles outside the central city, in the top story of a villa with a patio overlooking the rice fields, surrounded by lush greenery. The resort had everything you could possibly want right inside the grounds and if you didn’t want to leave you really didn’t have to. We enjoyed sunrise yoga one morning in an outdoor pavilion, and lay by the infinity pool drinking Chang beer and enjoyed several meals on our private patio. The resort even had two oxen -- one of them a unique pink ox. One of the things I was most looking forward to was all the Northern Thai food. The cuisine balances spicy, sour, bitter and sweet flavors in colorful dishes with so much depth of flavor. Aromatics, garlic, ginger and some version of ground chilies can be found in just about every dish. My favorite happens to be the dish that Chiang Mai is also the most well known for – khao soi, a noodle dish with a spicy coconut curry broth with both thin cooked egg noodles and thicker fried egg noodles on top. The most common protein served with it was chicken (gai in Thai); my preferred preparation was a dish that used whole chicken legs, braised in a coconut curry sauce until extremely tender. The chicken legs were cooked until the meat could easily be pulled from the bone using only chopsticks. There are several different night markets in Chiang Mai, the most well-known and largest being on Sunday night in old town Chiang Mai, located by the river. Stalls lined the closed off roads peddling everything from tourist trinkets, crafts, and clothing to delicious food. Every few hundred feet there were offshoots of food areas. It was hard not to stop at every stall, especially because there were so many that it would be hard to find the way back if it was passed over. We tried everything from tender, crispy fried chicken on a stick and Northern Thai sausage to heads-on grilled prawns. While we didn’t branch out to the more obscure foods that were offered, we did try liver sausage, but opted to skip the blood soup. For dessert we shared mini ice cream cones filled with the smallest scoops of ice cream and enjoyed waffles in the shape of fish and filled with nutella. Early one morning our guide, Tee, brought us to Thanin market in downtown Chiang Mai, a covered marketplace filled with sections of stalls selling an abundance of colorful fruits and vegetables, meats, fish and various prepared foods. The experience of the market was sensory overload. Walking in I was hit by a mix of pungent smells -- piles of steaming sticky rice, buckets of freshly made curry paste, fermented shrimp paste along with some steaming pots of prepared foods. With many of the dishes it was hard to determine their main ingredients – was that jackfruit or frog legs, raw beef with uncooked blood or fried insects? I’m an adventurous eater but I’m not adventurous when I don’t know what I’m eating. Of course many of the dishes were a lot more “normal” to our American palates. Aaron and I ended up getting a bag of sticky rice to pair with some spicy Northern Thai style sausage as we walked around the stalls. As part of the tour, we learned that Thailand relies heavily on its agricultural economy. The Royal Thai government started an initiative called the Royal Project Foundation to encourage farmers in Northern Thailand to switch from opium and poppy to organic fruit and vegetable cash crops while training them in new methods in order to help increase living standards and help with the opioid epidemic. We were able to try some local Thai fruits like rambutan, little hairy fruits that when the shell is removed reveals translucent and mildly sweet inside; mangosteen, the “queen of fruits” which gets its nickname because you remove the crown-looking top part to reveal the translucent segments of fruit. The most interesting fruit we tried was also the most controversial. Durian, the “king of fruits” is banned in a number of public places because of the putrid smell. The huge spiky fruit was cut open to reveal yellow segments – the segments of fruit are often sold on plastic-wrapped plates since the fruit itself is so large (between two and five pounds). The yellow segments were tender, revealing a white fleshy inside. The inside was sweet and tasted nothing like the smell, the texture similar to rich, creamy custard. Our guide explained that this exotic fruit was as divisive in Thailand as blue cheese was in the West, and to be honest it smelled like a rancid blue cheese combined with rotten eggs. I questioned the seemingly drastic need to ban it in public spaces until someone decided to bring a bag of dried durian onto one of our flights. Every time they would open the bag, surrounding passengers (myself included) would gag, as the oblivious passenger chomped away, oblivious to everyone else’s repulsion. After the tour of the market we were brought back to the resort for the Northern Thai style cooking class with the head chef at the resort, Tor. It was an intimate class setting; our classmates were two American teen girls. After an introduction to traditional Thai cooking styles and ingredients we went to our individual stations, which of course I took as an invitation to compete with Aaron over the preparation of every dish. Before turning us out to make our own versions of the dish the chef would walk us through the steps with tips. The set menu offered a variety of different cooking styles and base ingredients varying from fish and shrimp to pork and chicken. We started off by making “abb pla yang”, red tilapia marinated in Thai spices and wrapped in a banana leaf and grilled over charcoals. Next up was “larb muang moo”. Larb is a minced meat salad where the meat is either raw or cooked. 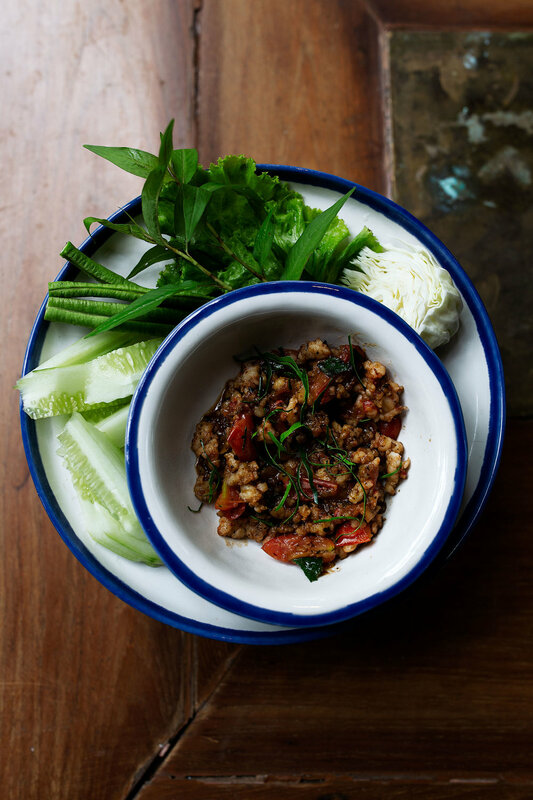 For this variation the base was pork cooked in a combination of chilies, and fish sauce which is then tossed with fresh herbs and served with a side of raw vegetables. One of the dishes I was most surprised by was “narm prig ong goong” a tomato chili dip with minced prawn. The star of the class was the “khao soi gai” the Chiang Mai curry dish with crispy noodles, cooked noodles and chicken. Each dish was adjusted in spice level for us tourists as the Thai locals enjoy an extreme level of spice. Despite the adjustment, the dishes we cooked still offered a harmonious balance of sweet, spicy, sour and bitter flavors. I would highly recommend anyone visiting Thailand take a cooking class, it was both Aaron’s and my favorite thing we did on our trip. Every person we talked to before going to Thailand told us that we had to get Thai massages. So while walking around Nimmanhaemin road in Chiang Mai we located a highly rated and popular place, took off our shoes outside and headed inside. An hour-long massage cost a mere $7.50 or about 250 ฿. This was Aaron’s first massage experience. Once upstairs, we changed into pajamas and lay down on mats on the floor separated by curtains. While it is not the most romantic, for $7.50 for each it was a great massage – I came out feeling thoroughly relaxed. Nimmanhaemin road is lined with restaurants and shops with a large mall at the end of the road. We spent a few hours wandering around, stopping every so often to get a beer or a snack. I stopped at an ice cream stall where I got a cone with a towering of three scoops of ice cream. Cheese ice cream may sound odd but the mix of salty and sweet went well with the other flavors of Thai tea and Hokkaido milk. Down the road we found a newer and more upscale area, One Nimman Square, which along with shops, had a street market where we stopped for some beef sausage, liver sausage and fried rice served in a hollowed out pineapple. Afterward we walked by a coffee shop, Graph, wherewe noticed that there were a bunch of Instagram-model-type girls taking photos in front of the shop, so we took this as a sign to try it. The inside was dark and dimly lit with small Edison coil light bulbs and a minimalist island coffee bar in the middle. We split a chocolate croissant and I ordered the “monochrome” a combination of espresso, vanilla and activated charcoal while Aaron ordered a cold brew. It was more than just a good photo opportunity -- the drinks were the perfect afternoon pick-me-ups. There were an abundance of coffee shops around Thailand; this may have been because there are a number of liquor laws around the country, which is largely Buddhist. The sale of liquor is prohibited between 2pm to 5pm and again from 12am and 11am every day of the week. Advertising liquor and beer is illegal in Thailand and as of 2017 the police announced they would be extending that interpretation of the law to include postings on social media. This isn’t to say we didn’t still drink a lot while we were there – it was just during the given hours. I made a reservation at David’s Kitchen in Amphoe Muang Chiang Mai, a restaurant regarded as one of the best in the city. Located on the outskirts of town the cuisine is predominantly classic French with a Thai twist, making for a memorable meal. I always say that the staff can make or break a meal. Even if a restaurant serves great food outstanding service takes it above and beyond. The manager, Tae, offered great recommendations and came to our table and chatted with us about our trip and his upcoming visit to California to see his brother -- his first stop would of course be to “In n Out”. I started the meal with a rendition of lobster bisque topped with foam while Aaron started with French onion soup. While Aaron’s entrée, the lobster fettuccine with shaved black truffle combined two of my favorite ingredients, my choice of the braised beef cheek in red wine sauce and mashed potatoes was the winner of the evening. The beef was melt in your mouth tender with a rich yet delicate sauce. From Chiang Mai we took a morning flight to Phuket. While overall we lucked out with the weather during the rainy season we were not prepared when we tried to find our driver at the Phuket airport. We were crossing the parking lot when we were caught in a torrential downpour and got completely soaked before finding cover below an underpass. We finally located our driver and made the trip to the resort in Phuket about 40 minutes from the airport. We stayed at the Naka, a hotel known for its impressive, award-winning design and architecture. The stone and glass villas cascade down the hillside each with a private pool and ocean view. The modernist interior of grays and wood have become inspiration for my future home – if only I could also get the ocean view through floor to ceiling glass windows to come with it all. We spent a lot of our time in Phuket lounging by our private infinity pool, drinking and reading our respective books. With room service delivered to us we had just about everything we could want inside our villa grounds. The elephant sanctuary in Phuket was an eye opening experience and one of my favorite activities of the trip. We took a taxi using the app, Grab, the Thai equivalent of Uber, to the meeting point for the sanctuary where we were then loaded onto trucks and taken up to a remote jungle. Before getting to see the elephants up close they show an educational video detailing how they buy the elephants out of captivity in order to get them to the sanctuary and gave us a look into the poor living conditions in which they exist before coming to the sanctuary. The elephants at the sanctuary are all older females, many with physical injuries or handicaps – males with tusks or younger elephants are much more expensive. The Phuket sanctuary is still relatively new; in the year and a half since opening they have rescued 10 elephants from captivity and poor living and working conditions within the tourism and logging industries – think forced to carry excessive weight on their backs, including trees and often made to act in the circus and then they suffer bodily pain if they don’t follow the mahout (elephant keeper’s) orders. We were guided around the 30-acre property and introduced to the elephants. They are such majestic and gentle creatures, which is even more impressive when viewed in contrast with their size – the average female Asian elephant weighing in at around 6,000 pounds. We fed the elephants bananas and other fruit from our hands. Their large trunks are made up of more 40,000 muscles giving them complete control over the slightest movements. I was left in awe of the gentle giants. Another day we ventured into Old Town Phuket. Some tourists from Vietnam we met at the sanctuary had spoken highly of a restaurant called One Chun so we looked it up. It ended up being a great choice – we had some of the best crab curry I’ve ever had. The creamy yellow curry and coconut milk broth was filled with pieces of fresh blue crab meat and was served with a side of thin rice noodles. The noodles were added as the dish was eaten so they didn’t get too mushy sitting in the broth. The Thai paste with dried shrimp and garlic served with fresh vegetables was aromatic and funky but was outshone by the fried ribs with garlic and pepper. Small pork riblets were deep fried and tossed in a sticky soy glaze and topped with a mound of crispy garlic. After walking around Old Town Phuket, a sleepy beach town that comes alive more in the nighttime,we walked to dinner where we had a reservation at the Blue Elephant. The restaurant is housed in the 105-year old historic former governor’s mansion and serves upscale Thai food. We accidentally ate more than we were planning to at lunch so we weren’t starving when we showed up to our reservation. The hits included crab soufflé and honey spare ribs and lamb korma served with roti and saffron rice. Railay Beach is only accessible by boat so in order to get there we took a ferry from Rassada pier in Phuket to Krabi on the west coast of southern Thailand. It turned out to be quite an adventure. Somehow either the ferry couldn’t make it to the correct pier or we were given the wrong instructions (we’re still unsure what happened). We were ushered from the “wrong” ferry’s pier to a truck which then took us to another pier where we were told to get on long boats. We had our luggage and belongings piled on a ramshackle wooden boat that in any other situation would have been fun. On the boat ride, we were pelted with water so I had to use my rain jacket to shield my coveted Celiné bag. We later found out that we could have taken the hotel boat from one of the piers, which would have definitely been an upgrade. Once we got to the hotel in Railay Beach and determined that nothing got ruined it was a story we could laugh about. We stayed at the Rayavadee, a resort on Railay beach where we had a two-story villa in an idyllic tropical setting. Spending a few days surrounded by beaches, warm water, palm trees, cliffs and fruity cocktails was the perfect way to end our trip. There were even monkeys that scrambled around high in the trees and ran around on the rooftops of the hotel restaurants. Aaron kept them at arms distance because he thought he would get peed on (we didn’t) but I just wanted to take photos of them. Once the weather cleared up, but still shaken from our tumultuous boat trip we decided we needed two large Chang beers and tequila shots. At a Rasta themed bar (which there was a surprising amount of around Krabi) we ordered fruity yet alcohol heavy cocktails which we enjoyed into the night. That night walking back to our hotel we had another “adventure” -we found that at night and in the early morning the tide comes so high up on the beach walkway, that the only way to get back to the hotel, is virtually non-existent. We finally made it back to our hotel by walking in water that was up to our waists. Aaron had ordered a custom suit (taking advantage of that exchange rate) and when he went to pick it up one morning we had to wait for the tide to recede so he wouldn’t have to carry it back over his head. Luckily, by 2pm the tide receded 200-yards back off the beach and he could get to his suit. On our second day in Railay the weather was ideal with sunny skies and crystal clear water. We started the day with a swim, riding the waves and floating in the turquoise marine, our only tough decision being whether to stay in the ocean or move to the pool. For lunch we ordered padThai from one of the stalls and ate it on the sand along with a young coconut that was cracked open with a hatchet right in front of us. Once the tide went down we wandered around the mangrove trees on the other side of the hotel where just above us we could watch talented rock climbers as they ascended the cliffs. Our last night in Railay we sat on a ledge overlooking the beach with large Chang beers in hand talking about how perfect the trip had been. We had settled on three different areas of Thailand so that we could really experience everything the country had to offer and we agreed that we had done just that. And we felt that two weeks was the perfect amount of time for a honeymoon. It was long enough to really get away and spend time exploring a different culture without starting to stress about missing too much work. We ended the trip with a few tight connections but ultimately made it back to Los Angeles after a long travel day from Chiang Mai to Bangkok, Bangkok to Shanghai and Shanghai to LA. So we are back in LA and I’m already craving more Khao soi and mango sticky rice, as if I didn’t already eat enough Thai food there. I miss Thailand already.